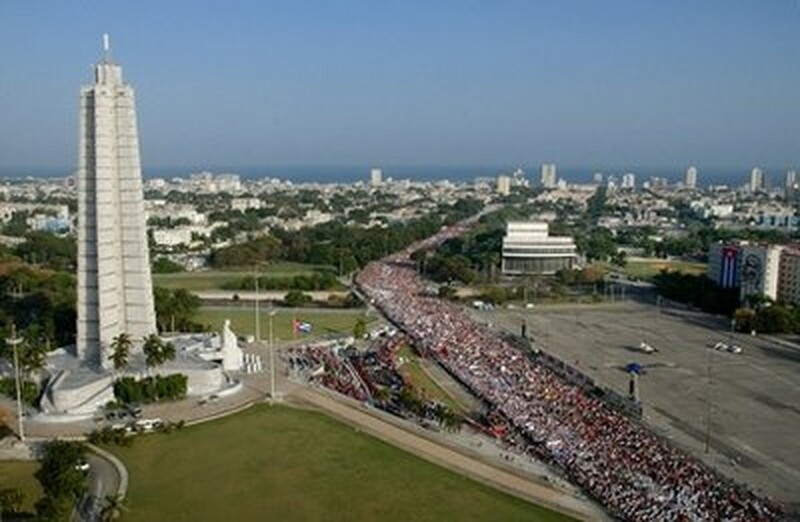 Hundreds of thousands of Cubans marched through the sprawling, concrete expanses of Revolution Plaza on Saturday in annual May Day celebrations that the government said prove the island supports its communist system even amid mounting international criticism over human rights. The turnout has long been massive for International Workers' Day, but this year officials assigned the event special meaning, saying it was Cuba's response to Washington, the European Union and international journalists who have conspired to tarnish its reputation after the February death of a jailed dissident hunger striker and a protest by another opposition activist who has refused food for weeks. People march to commemorate Labor Day near Revolution Plaza in Havana, Saturday, May 1, 2010. Pro-government crowds dispatched in well-organized shifts also blocked a small, weekly march by a women's group supporting political prisoners for three weeks running in Havana. But there was no sign of discontent among the islanders who thronged the plaza, with lead demonstrators carrying a giant banner reading "Unified in Duty." It was "the most energetic and firm response to those who, from the centers of power in the United States and the European Union, backed by tiny mercenary groups, try to discredit us with false slanders," said Salvador Valdes Mesa, secretary-general of the nearly 3 million-strong Cuban Workers Confederation. Some marchers sang, others waved cardboard signs declaring "We are the people of Fidel and Raul" or decrying the United States. A few screamed "Long Live Fidel!" until they lost their voices. Wearing a straw hat and white dress shirt, President Raul Castro grinned and waved from a high wooden podium as marchers streamed past. His older brother Fidel has not been seen in public since undergoing emergency intestinal surgery nearly four years ago and it was no surprise he didn't show, though organizers used loudspeakers to blast past recordings of his voice. He also failed to issue a written statement in the pre-dawn hours before this year's march, as he had done the three previous May Days. Officials at government schools, offices and factories that employ that vast majority of Cuban workers strongly urge everyone to attend the yearly rallies and organize transportation. The march was over in barely two hours, far less time than it used to take Fidel Castro to get through one of his May Day speeches of years past. This time only Valdes spoke, urging Cubans to be more productive despite average state salaries worth only about $20 per month. He struck a somber tone, warning that Cuba would have to "confront realities" economically that could make life even tougher for many who are already grindingly poor. The government dismisses the island's small political opposition community as paid mercenaries of Washington, and Valdes denunciation likely referenced the Damas de Blanco, or Women in White, wives and mothers of 75 community organizers, independent journalists and political activists who were imprisoned during a sweeping government crackdown on dissent in March 2003. Fifty-three remain behind bars. Nearly every Sunday for seven years, the women dressed in white and marched — usually without incident — along leafy Fifth Avenue in Havana's swank Miramar district, far from the Revolution Plaza area. But counter-protesters and international media appeared in March, when the group held a week of demonstrations in other parts of the city. 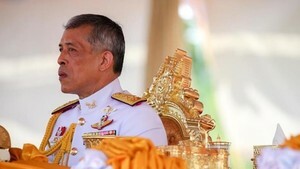 Officials and counter-demonstrators have blocked their last three demonstrations. Special attention has been focused on human rights in Cuba since the Feb. 23 death of Orlando Zapata Tamayo, the first island opposition figure to die after a hunger strike in nearly 40 years, sparking outcry in the U.S. and Europe. Another dissident, Guillermo Farinas is not in prison but says he will keep refusing food and water until he dies — though he has received nutrients intravenously at a hospital near his home in the central city of Santa Clara.